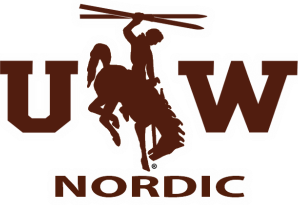 University of Wyoming Nordic Ski Team aims to create a community upon which a foundation of fundraising and volunteer coaching allows each athlete to reach his or her full potential in both skiing and leadership while making a positive environmental, social and community impact. ​The University of Wyoming Ski Team offers diverse options for continuing your ski career in college. Established in 1998 by athletes from Wyoming and Colorado, the team welcomes athletes of all abilities and interests. The team is divided into four parts: the elite racing team, the competitive racing team, the recreational racing team and the non-racing team. Training 3-6 times a week during the fall and winter, the winter comes with up to 10 race weekends. Competitive and elite team racers compete in the United States Collegiate Ski and Snowboard Association (USCSA) against teams such as Air Force Academy, Colorado Mountain College and Western State College. In addition, the elite team also does 2-3 NCAA Division I races each year, competing against ski super powers such as University of Denver, University of Colorado, University of Utah and University of New Mexico, as well as an international travel experience once every few years. The recreational team attends all races in Laramie as well as any races that do not require an overnight trip. Each season the UW Nordic Ski Club raises upwards $30,000. That money is spent on entry fees, travel, race wax and lodging. Club Sports helps by matching a preset amount. The team works extremely hard to raise money, recycling after football games, raking lawns, hosting a benefit dinner and many other activities. Our biggest and best activity is Trash 2 Treasures. Every club member is expected to participate in these activities. With the responsibility to fund their ski season, comes the unique opportunity to gain student leadership experiences. A student governing body composed of 10 elected athletes provides team leadership, organizes fund raising and volunteer activities and allows the team to remain connected to the community. The value of such leadership experience can not be overemphasized and has allowed previous athletes to earn scholarships, awards and be competitive for jobs and graduate school. If you have any questions about training, racing, fund-raising or anything else please feel free to contact us.